Saturday May 1st 1909 When we were at breakfast Will Anderson called and told us Mr Whitaker had died at ten oclock last night. I was very busy all morning with baking and churning. Will went to town at 1.12 I wrote a long letter to Lydia took it to the mail box and got things at the store. I did some mending and read some. It has been a perfectly terrible day so very cold. A terrific wind with gusts of snow. Sunday May 2d 1909 The weather somewhat better. I was busy with the work most of the forenoon as we had to have dinner early to go down at 12.12 to attend Mr. Whitakers funeral which was held at 1.30 Just as we were ready to go Will found Lady's colt sick that he had to stay and get Dr Edwards out. I met Hattie in town and went out with her. There was a large funeral. Mr Clarkes sermon was most appropriate. I went over to Mrs. Smiths and she and friends there walked down town with me. I called at Harts. 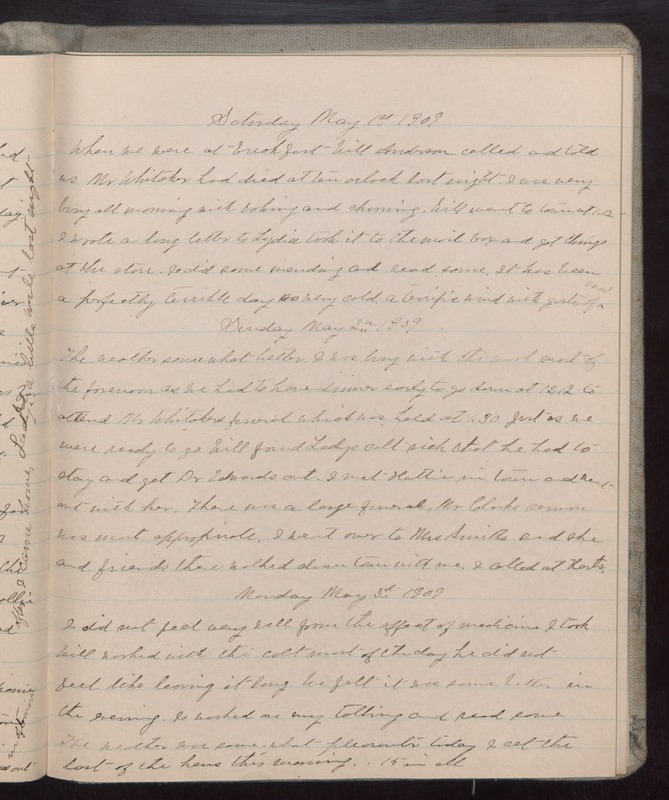 Monday May 3rd 1909 I did not feel very well from the effect of medicine I took Will worked with the colt most of the day he did not feel like leaving it long. We felt it was some better in the evening. I worked on my tatting and read some The weather was some-what pleasanter today. I set the last of the hens this evening. . 15 in all.